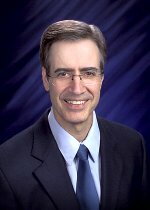 PNNL chief scientist Steven Wiley has been elected a Fellow of the American Association for the Advancement of Science (AAAS) for "significant contributions in the newly emerging area of systems biology and for important achievements in the quantitative analysis of the EGF receptor system." As Director of PNNL's Biomolecular Systems Initiative, Wiley has built a program to develop and leverage PNNL's unique capabilities in cell imaging, computational biology, and high-throughput proteomics to understand cell communication. His research has focused on understanding mechanisms of cell communication using the epidermal growth factor receptor (EGFR) system as a model. More recently, his work has focused on understanding regulation of growth factor shedding and autocrine signaling as a mechanism by which cells interpret their microenvironment. This work also involves mapping cellular networks connected to ligand shedding and receptor heterodimerization to determine how information is decoded from multiple inputs. Wiley will be honored at the February 18, 2006 AAAS Fellows Forum as part of the AAAS Annual Meeting in St. Louis.